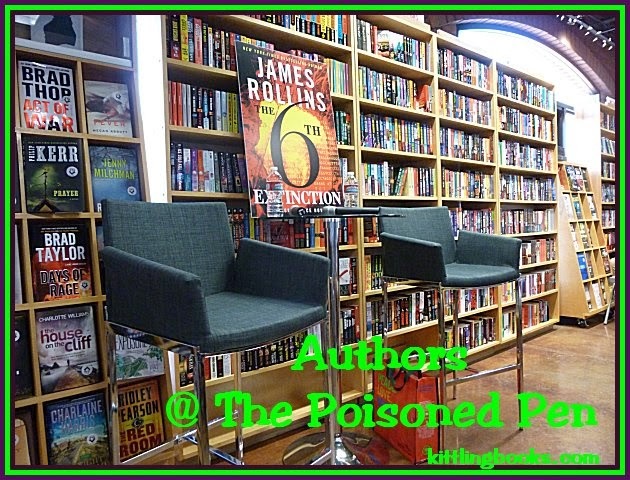 At The Poisoned Pen with Faye, Jonathan & Jesse Kellerman! It's a rare occasion when Denis and I aren't the first ones at an author event at The Poisoned Pen, but this was an exception. After all, it's not often that the writing Kellermans-- Faye, Jonathan, and Jesse-- make an appearance together here. I'd had a feeling that this was going to be one of those standing-room-only nights, and I was right. The staff hadn't even finished putting out all the chairs before people were pouncing on the ones they wanted to reserve. Happy 25th Birthday to The Poisoned Pen! 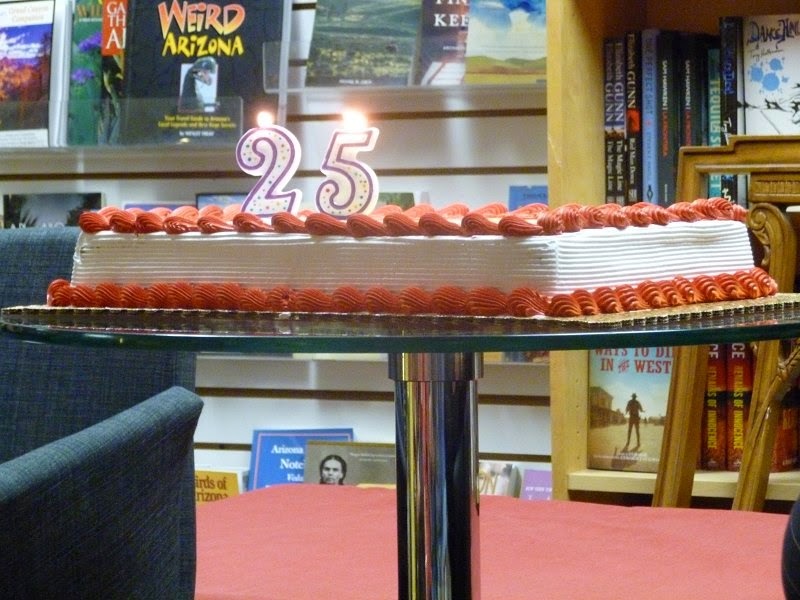 Since the next day was Yom Kippur (Friday, October 3), owner and host Barbara Peters decided that The Poisoned Pen would celebrate its 25th birthday a day early, and two cakes were brought out for everyone to enjoy. (I never got a chance to see the kosher one.) Denis enjoyed his slice of cake; I declined mine because I wasn't willing to discover how good I was at juggling notepad, pen, camera, cake, napkin, and fork. I may not be a cook, but even I know that would've been a recipe for disaster! While the cake was being cut, Barbara told us about the open house that would be held on Friday, December 12 from 4 to 8 PM to celebrate this very important birthday. Open to all, and with plenty of food and drink, there are also going to be special appearances by Diana Gabaldon, James Sallis (and his band), Dana Stabenow, Jenn McKinlay, Donis Casey, Betty Webb, Eileen Brady, and many other authors. Even though I'm sad that Denis won't be able to attend, I know where I'll be that evening! "Read this, you'll hate it." 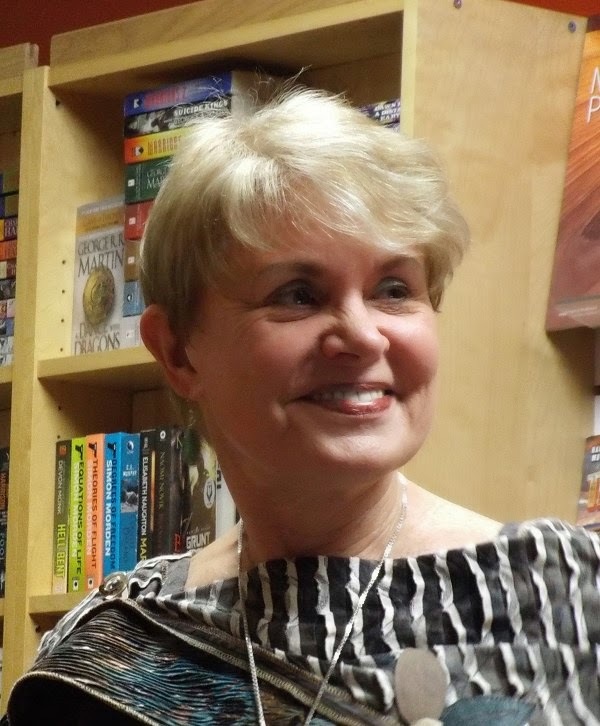 Barbara introduced her guests by saying that it had been six years since all three of them had appeared at The Poisoned Pen together, and that Jonathan and Jesse were the only father and son to be nominated for an Edgar Award. Faye spoke first, telling us that she had always been a storyteller, even as a child. When she and her family would visit her grandparents, Faye would be so full of stories that her grandmother would ask, "Is this child normal?" As Faye was growing up, they discovered that she was phonetically dyslexic, which means that she had trouble reading and spelling because she couldn't break words down into their sound parts. She did find out that she has a natural affinity for math, and she eventually went into dentistry. While Jonathan was a psychologist for many years, Faye learned that she hated dentistry and began writing at home while their children were napping. One day when Jonathan had their third child snoozing on his shoulder, Faye thrust a manuscript at him, saying, "Read this, you'll hate it!" Jonathan said, "It was one of those moments. Why should she be a writer? She's the math genius. I'm going to hate it. How am I going to tell her? We're going to have a big fight. This is not where you want to be! I started reading it, and it was really very good. I had known Faye for thirteen years, and I never knew she had any writing talent at all. It was freaky. I told her, 'Honey, this is really good!' and she said, 'No, you're just saying that," and we had a big fight. But I finally convinced her and I called my agent. 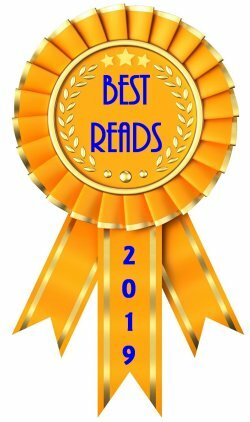 My agent loved it, and she got published right away. Neither one of us came from a writing background, neither of us was encouraged to write, yet here we both are making a living from it." Barbara wanted to know Jesse's experience. 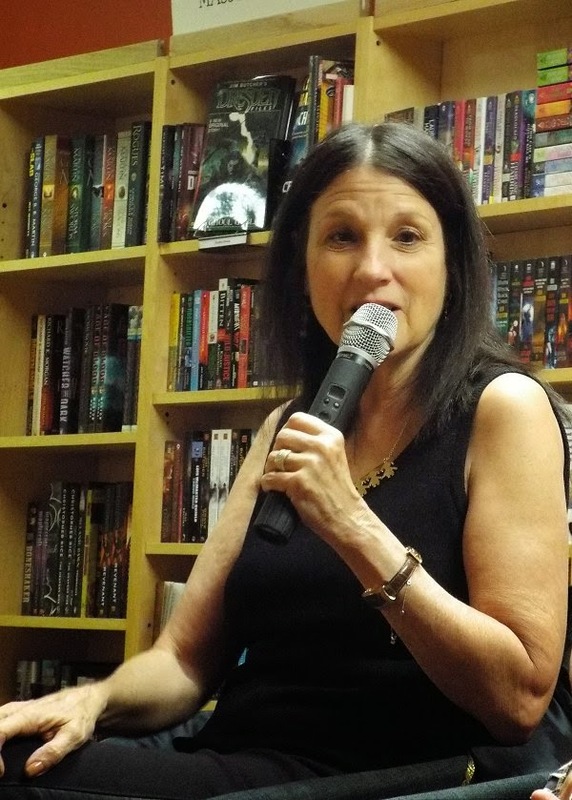 "Were you sort of compelled into writing? You began as a playwright, isn't that correct?" "I wouldn't say that I was compelled," Jesse replied. "People frequently ask is it nature or nurture, and obviously it's a bit of both. The way I look at it is that every family has its own language, and our family's is a very story-driven language. It's how we understand the world. "I have a son who's five, and he runs around telling stories. He recently dictated a short story to me. He's in pre-school, and they have them keep journals. Most of the journals are what you would expect from pre-schoolers. They're incoherent and all over the place. My son's are very linear; they have a plot. One of the parents of another pre-schooler came up to me and said, 'Your son seems to have a better grasp of plot than the other children.' I don't know if it's because that's just the way my son is or because of the way I talk to him." "When you talk about the nature-nurture," Jonathan said, "I love to tell this story. My first novel was published in 1985, and Jesse was born in 1978, so he was seven, and during that time I was a psychologist. He didn't see me as a writer. But when he was three years old, he came to me and said, 'I wrote a story, write it down!' And he started to dictate stuff to me. So clearly it was biological-- and with two parents! It's like with Stephen and Tabitha King who have two kids who are very good writers. I think we understand that when it comes to sports it can run in families, and with math... and now maybe with writing in some cases." Barbara Peters enjoying the evening. "Sometimes when people ask me I like to say it's because we all share a genetic aversion to normal employment," Jesse said, which made everyone in the room break into laughter. As I looked around, all I saw were smiles. Everyone was enjoying themselves so much, and it was such a wonderful thing to see. "There's one more thing I wanted to bring up before we start talking about the plots of your books," said Barbara Peters, looking at Faye. "I was visiting your website, and you were saying that dentistry prepared you for the human body and victims because you had to study gross anatomy in order to be a dentist." "Dentistry not only allowed me to look at a body, and a dead body, from the inside out," Faye said, "what dentistry really did for me more than even taught me about science which is good in and of itself, it taught me how to be organized. When you go in for any sort of procedure, the last thing you want is to have your dentist or doctor start fumbling for an instrument. I approach my writing in pretty much the same way. I lay out everything I need to do my writing, I look at my outline, I go over the work I did the day before-- I'm very, very organized. And of course knowing the body from the inside out when they discuss something, I can actually visualize it because I have done gross anatomy." As a psychologist, Jonathan worked in a hospital for many years, in oncology and he was the head of the psych program for the Children's Hospital of Los Angeles. "I saw a lot of human experience," Jonathan said. "I got involved with the criminal justice system as an expert witness. I had a very interesting time in psychiatry, and I was privileged-- without ever planning it-- to be thrust into all sorts of experiences and to meet people from all walks of life. It was a tremendously enriching experience in what they now call diversity." 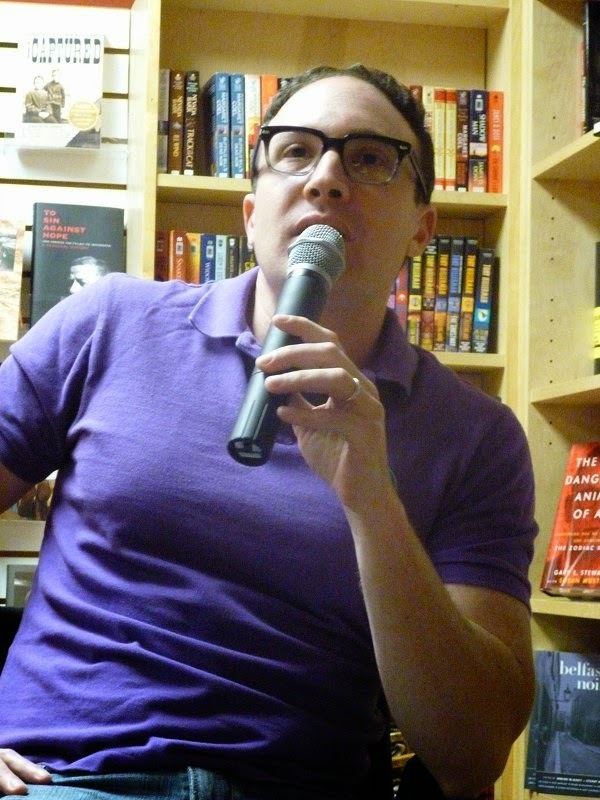 It was when he entered private practice that Jonathan became interested in the hard-boiled California crime writers of the previous generation-- in particular Ross MacDonald. When he read MacDonald, he thought, "Whoa, psycho-pathology in Southern California. I can do this!" 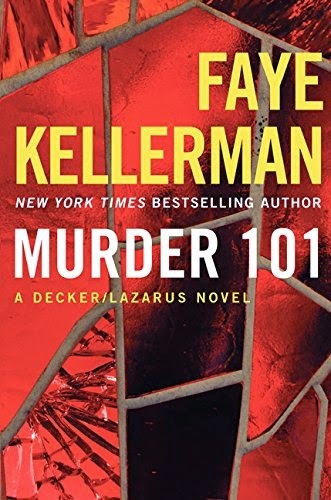 When Barbara Peters read Faye Kellerman's Murder 101, she thought it was a fascinating book because the author had decided to shake things up. Decker has retired, and he and Lazarus have moved back to New York state. The area is accustomed to routine small town crime, and it's now being faced with solving a murder. Faye also brings in a youthful element. "When you have series characters, you've written them a certain way, and you can't change that," Faye said. "What you can do is to put them in different situations and see how they respond, and that's what I've done here. Putting them in a small town also allows Rina to take on more roles that wouldn't have been appropriate in Los Angeles, and Pete can also become a mentor. It was so much fun. First of all, since they moved back East I got to allow them to wear winter coats. You here in Arizona will understand! So there's a change of season, a change of atmosphere, and a change of architecture." Barbara brought in the Louis Comfort Tiffany angle and the high number of pieces he did for mausoleums. Most of his work is religious. Stained glass for churches and synagogues, mosaic works.... In doing research, Faye discovered that there is a lot of theft in graveyards-- urns, monuments... all the way to edgers and lawnmowers. The Golem of Hollywood is a joint writing venture of Jonathan and Jesse. 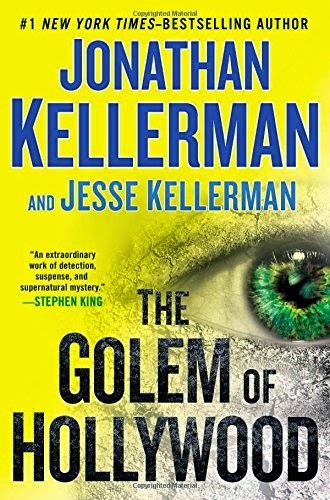 The Golem began as a Jewish myth, but is now universal, having been used as the basis for novels like Frankenstein and even appearing in The Lord of the Rings. Jonathan Kellerman loves writing the Alex Delaware novels, but he is a writer and once in a while he wants to do something different. During a trip to Prague, he was inspired to use the Golem as the basis for a novel with more supernatural elements. He didn't know if anyone was going to like it, but he wanted to try. One evening at the dinner table, he asked Jesse if he would want to write the book with him. Originally Jesse wanted his father to write the entire novel, but he soon came on board whole-heartedly. Everything looks favorable, and The Golem of Paris will be out next year, but there's always some skepticism when established writers do something different. Jonathan sent the novel to Stephen King, who read it and three days later sent Kellerman an email of praise, saying that he could recognize both writers' voices in the book. "I loved the premise when Dad told me about it. He was basically ego-less during the entire writing process," Jesse said. 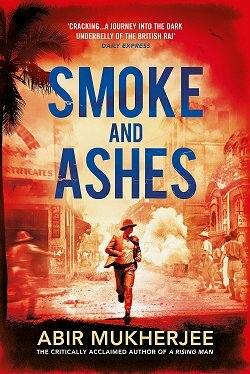 Burned-out LA detective Jacob Lev is at the heart of the novel. He is a loner, a tortured soul, and Jonathan knew he didn't want to write this solo because it was going to be a big book. 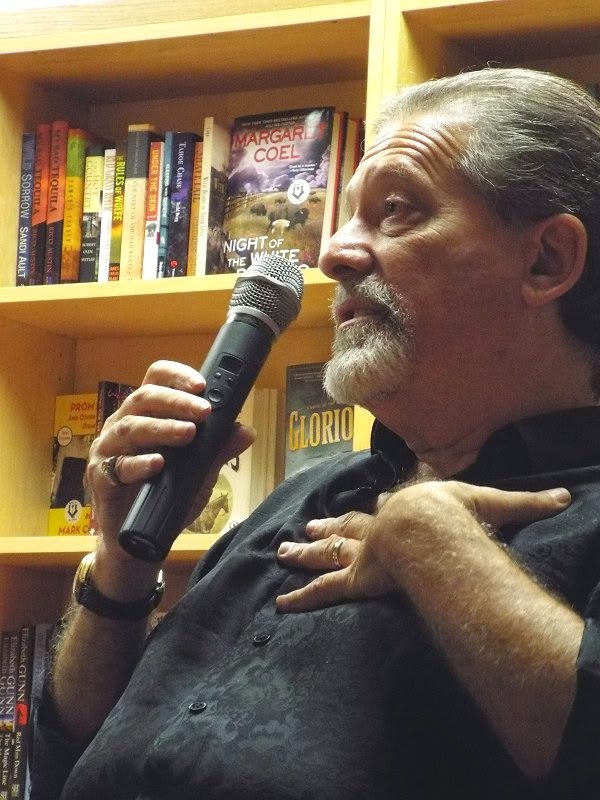 "At the core, this book is a crime novel," Jonathan said. "Writing with Jesse was something I couldn't do until he'd had his own success. It was a wonderful collaboration that was done through a long series of emails since Jesse lives in a different city." Jonathan then went on to say, "Writing is proprietary. Your novel is the next closest thing to your child. 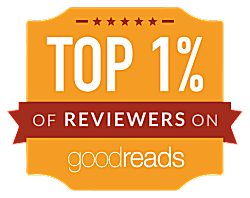 That's why we get so mad when we get a bad review; it's like someone insulting your kid! But you have to start out completely differently in a collaboration." Faye then insisted on saying a couple of things about The Golem of Hollywood. "Jacob Lev is a great cop. He is driven, and I love driven characters! Also, I'd like to say something about the collaboration between these two. There is something magical that happens when two people who are blood related write together. There is a symphonic quality to the writing because there are genetic commonalities. That's what you have in this book. There are such smooth, beautiful transitions in the book that you would never ever think this was a collaboration. It sounds like one voice." "The book starts in Prague, then jumps to Los Angeles. Why LA?" asked Peters. Jonathan laughed. "I love LA. It's what I know, plus the title is just so enticing!" The Poisoned Pen's event coordinator David Hunenberg wanted to know... what if Decker were the LA cop facing the Golem? Jonathan replied, "It wouldn't happen. It was a twisted case that required a twisted guy." Faye agreed. "The case chose Jacob," she said. 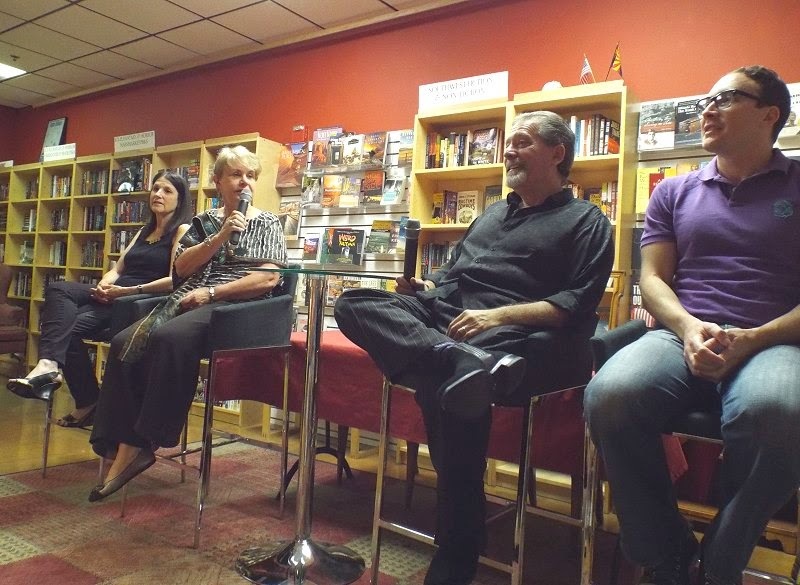 "We wanted to write a crime novel with supernatural elements, but also a romance. A cosmic, mega-romance," Jonathan said. "And we're very happy. 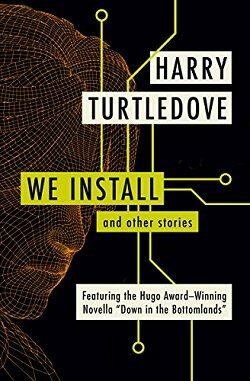 Not only was the book chosen by the Book of the Month Club, it was also chosen as a selection by the Science Fiction Club, the Crime Club, and the Romance Club. So I think we did a decent job on that romance!" 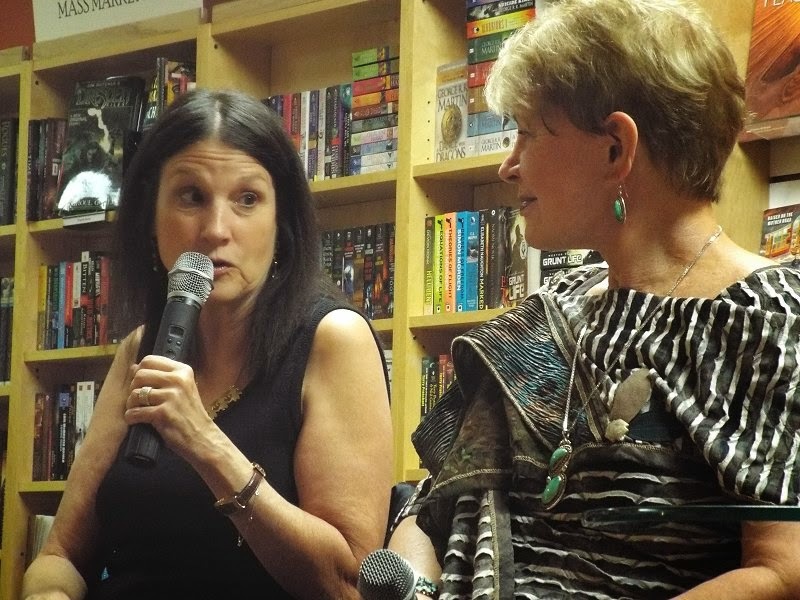 Faye's next book is A Seminar in Death, the follow-up to Murder 101. It dabbles a bit in theoretical mathematics, so-- at last-- Faye's talent in that area will be used. As for Jesse, "The Golem of Paris is taking all my time." During a brief question and answer period, a woman asked how Jonathan and Jesse divided the work on The Golem of Hollywood. "I did the verbs," Jesse quipped, which brought down the house. Both men were conscious of trying to see through each other's eyes and of trying to write with each other's voice as they worked. "I respect Jesse tremendously as a writer," Jonathan said. "Actually many many times he did things I couldn't do. He's got tremendous talent. I'm very proud that he's my son, and it's a pleasure to work with him. That's a big kick when you can write with your son! It was just wonderful." As the evening ended, all I could do was echo Jonathan: it was just wonderful. Cathy - As the song goes, 'Oh, what a night!' So glad you were able to see the Kellermans. And I can well imagine they'd have played to a packed house. Thanks so much for sharing that with me-- I love it! A great evening was had by all. Glad it was so much fun. It's hard to think of two people writing together, but father and son seem to do it seamlessly. The evening must have been peppered with wit and laughter. And I still can't believe that Barbara Peters is 75. She looks fantastic here. She's always attributed it to her genes, but I think being busy with books and traveling-- and just plain being happy-- are deciding factors, too.